Kingdom Hearts III launches worldwide in just over two weeks, and we’ve come prepared to prep you on the sequence of events that lead up to this moment. Kingdom Hearts has a very hard-to-follow story for many, so we’re going to break down the evil intentions of the game’s main antagonist, Master Xehanort… and his many incarnations. Hang in there, we’ll get through this together. Grab a snack and some water. This’ll be a long one. Xehanort is a Keyblade Master who believes that all worlds in the Realm of Light should exist with the perfect balance of Light and Darkness. Being granted the power of Time Travel by his future Heartless embodiment, he has brought grief through all of the series in his many forms and plans to bring all of them together in Kingdom Hearts III in attempt to reforge the χ-blade (“key-blade”), which is a powerful Keyblade that protects the “heart of all worlds” and “source of ultimate power and wisdom”: Kingdom Hearts. This man had years to plot out his diabolical plan, and many think that it’s evolved over time from balancing the Darkness with the Light to controlling all of Darkness and the power of Kingdom Hearts itself. But I digress– let’s leave that to speculation and talk about those other incarnations, shall we? Terra-Xehanort first appeared in Kingdom Hearts: Birth By Sleep and is the combination of Terra’s body and Xehanort’s soul and will. In the game, Master Xehanort was growing old and saw Terra as a potential vessel to prolong his life in order to pursue his ultimate goal of reforging the χ-blade. In the end, Terra unleashes his Darkness to fight back against Master Xehanort, but doing so exposed his weakness, and Xehanort was able to take over. However, just before he was able to complete the χ-blade, Terra’s friends, Ventus and Aqua, manage to destroy it, causing an explosion of Light that landed Terra-Xehanort in Radiant Garden, where he’s overcome with amnesia forgets who he is, remembering only his name. There, he was put under the wing of Ansem the Wise, a scientist who was studying the mystical properties of the Heart. Xehanort’s curiosity grew over time, and Ansem the Wise began to think that their experiments were unethical and dark, thus scrapping all of his projects. Xehanort, however, got a hold of Ansem’s reports and continued his experiments in secrecy with the help of Ansem’s other assistants. One fateful day, they did an experiment on themselves that propelled Master Xehanort’s plans back into motion: the Hearts of Terra-Xehanort and the other assistants were extracted from their bodies. When a Heart is removed from one’s body, a Heartless and a Nobody are created. The Heartless is the embodiment of the Darkness from one’s Heart, while a Nobody is the empty shell left behind. There are exceptions Heartless and Nobodies, though: Those with strong wills retain their human appearance a past memories when turned into a Heartless and Nobody. That’s exactly what happened with Terra-Xehanort. The experiment created two beings: the Heartless called himself Ansem, Seeker of Darkness and the Nobody called himself Xemnas, both taking the name of the man whose studies got them to where they needed to be. On top of that, they regained their past memories of Master Xehanort and continued with their plans. Ansem, Seeker of Darkness is the first version of Xehanort we are ever introduced to in the Kingdom Hearts series. Not having a body, Ansem, Seeker of Darkness first started out as a figure cloaked in a brown robe. Because his Heart wasn’t tied to a body, Ansem, Seeker of Darkness, had the ability to travel through time. Because of this, he went back to way before the events of the entire Kingdom Hearts series– back to when Xehanort was but a young boy on Destiny Islands. There, he told his former self of his plan to gather 13 Darknesses in order to reforge the χ-blade and left him to begin his quest– but not before also granting him the power to time travel! After Ansem, Seeker of Darkness, returns to his own time (the events of the original Kingdom Hearts), the continues to put his plot in motion. With Young Xehanort gathering the 13 Darknesses, he tasked himself with gathering the 7 Pure Lights. Together, these 20 pieces would reforge the χ-blade. First, much like Master Xehanort did to Terra, Ansem, Seeker of Darkness connected his Heart with that of Riku, a young boy who is the best friend of the series protagonist, Sora! Doing so finally gave him his human form. Through manipulation, he joined forces with Maleficent to collect the 7 Pure Lights, also known as the 7 Princesses of Heart (Alice, Snow White, Cinderella, Aurora, Belle, Jasmine, and Kairi). Together Maleficent and Ansem, Seeker of Darkness (as Riku), successfully gathered the 7 princesses, but there was one problem: the seventh Heart was missing. Kairi’s Heart resided within Sora, so Ansem, Seeker of Darkness, was never able to fully complete his task. Sora defeats Maleficent and sacrifices himself to free Kairi’s Heart. Kairi’s Light revives Sora, however, and together the 7 Princesses of Heart protected the world while Sora went off to face Ansem, Seeker of Darkness. In the end, Sora manages to defeat both Maleficent and Ansem, Seeker of Darkness. This allows Riku to take repossession of his own body, and, with the help of Sora, Donald, Goofy, and King Mickey, seal the door to the Realm of Darkness, which Ansem, Seeker of Darkness had opened in attempt to overpower Sora. We learn in Kingdom Hearts: Chain of Memories that Ansem, Seeker of Darkness, was only subdued within Riku’s Heart, not defeated. Throughout the events of Kingdom Hearts: Chain of Memories, Riku battles with the Darkness inside his Heart, which takes the form of Ansem, Seeker of Darkness. In the end, Riku overcomes the Darkness by controlling it, not expelling it, realizing that his path isn’t set for the Darkness or the Light, but rather the Twilight in between. Ansem, Seeker of Darkness, is never really seen again until Kingdom Hearts: Dream, Drop, Distance where it is shown that Young Xehanort has almost completed forming the true Organization XIII, the 13 Darknesses. Ansem, Seeker of Darkness, is one of them. 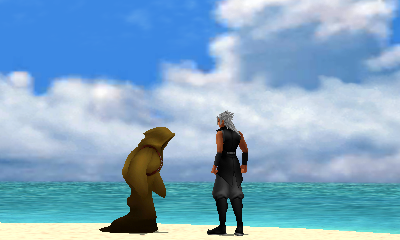 So we’ve talked about (Terra-)Xehanort’s Heartless, but let’s move on to his Nobody, Xemnas. Xemnas is the leader of Organization XIII, a group of Nobodies who all wish to become whole (regain a Heart). Every member of the organization uses the name of their original self, but scrambled up and inserting an “X”– Ansem scrambled + X = “Xemnas” (remember I said Xehanort goes on to use the alias of his former teacher, who is Ansem the Wise). Xemnas wanted to harness the power of the Keyblade in order to destroy Heartless. Doing so would free those Hearts, and they would go on to forge a new Kingdom Hearts and “become whole again.” However, this was just a facade to trick the other members into helping him. His real intentions were to form an organization of empty shells, and, by using Kingdom Hearts, he would place the essence of Master Xehanort himself within the 13 vessels, creating the 13 Darknesses: one half of the χ-blade. Let’s backtrack for a second: When Sora used the Key of Hearts (a Keyblade forged by using 6 of the 7 Princesses of Heart) to free Kairi’s Heart in Kingdom Hearts, this created a Nobody. Xemnas tracked down this Nobody and made the 13th member of his Organization, naming him Roxas (“Sora” scrambled + X = Roxas). Got it? Good. Now that he had the power of the Keyblade on his side in Roxas, he thought nothing could stop him from creating a new Kingdom Hearts. However, his plan was dented when Roxas finally realized that he was being used. Roxas planned to run away, but he was ultimately captured by Riku, and with the help of Ansem the Wise and Namine (the Nobody of Kairi, who was created at the same moment as Roxas), Roxas returned to Sora, making Sora whole again. But Xemnas still had another plan: to manipulate Sora into continue Roxas’s work of destroying Heartless. However, Sora finds an unlikely ally in Maleficent, who tells him of Xemnas’s plan. Sora was eventually able to, one by one, destroy everyone in the Organization XIII, and, with the help of Riku, put an end to Xemnas. Much like Ansem, Seeker of Darkness, though, it was revealed in Kingdom Hearts: Dream Drop Distance that Xemnas would be a part of the true Organization, thanks to Young Xehanort. We’re thinking more will be revealed about Young Xehanort and the other Darknesses in Kingdom Hearts III. It’s crazy to think that all of the series lead up to this. Even now, we’re still unsure of who the last Darkness will be. Who do you guys think? Let us know on Twitter!